The Lok Satta Party is legitimately proud that it has secured the economic future of the Telugu people. Most of the amendments LokSatta had suggested to the Andhra Pradesh Reorganization Bill have been incorporated, its national President Dr. Jayaprakash Narayan asserted today. Addressing a media conference, Dr. JP wanted people to ponder once again whether a vote to the Lok Satta will go waste. 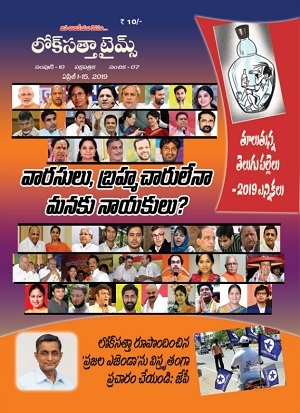 Has any one of the 293 others for whom the people voted in the last Andhra Pradesh Assembly elections has made a single suggestion to resolve the issues arising out of the State’s bifurcation? The credit for making rational, logical, constructive and practicable proposals when division of the State became inevitable goes solely to the Lok Satta, Dr. JP said. Dr. JP maintained that the Lok Satta has ensured justice to all the three regions of the State through its amendments. However, people can realize their dreams only when they change the very nature of politics. If they continue to patronize politics of money power, dynasty, caste and religion, there won’t be any change in their lives. They should vote for the Lok Satta which can provide leaders of integrity, competence and vision. Dr JP called upon the youth, and enlightened sections to utilize the LokSatta platform, emerge as leaders and promote the prosperity and future of Andhra Pradesh and Telangana States. Dr. JP complimented the BJP for owning up the amendments proposed by the Lok Satta and ensuring that most of them are incorporated in the Bifurcation Bill. He also complimented some leaders in the Congress who belatedly realized the consequences of their decision to bifurcate the State and initiated damage control measures. Dr. JP recalled that when the Government did not furnish the data the LokSatta sought on the financial implications of bifurcation, the party had to collect and collate data and present it to all those who mattered ranging from the President and Prime Minister to leaders of the Congress and the BJP. All those who took part in the debate in the Rajya Sabha had quoted the data furnished by him. The greatest problem the residuary or new Andhra Pradesh faced concerned the huge deficit it faces following Hyderabad city which enjoys a surplus of Rs.13000 crore becoming part of Telangana. The challenge is to compensate for the loss of future AP State, without sharing revenues of Hyderabad city. The Center has now offered to make good the deficit. Thus, the overall resources of Telugu people will be enhanced leading to a win-win solution. To promote industrialization, the Lok Satta had suggested that North Coastal Andhra and Rayalaseema be declared as Special Category Regions and extended all incentives granted to Special Category States. The Union Government has agreed to treat the entire residuary Andhra Pradesh as a Special Category State. It will result in huge transfer of funds from the Center to the new State as also huge grants for Centrally-sponsored schemes. Future Andhra Pradesh state will now get tax exemptions in excise duty and corporate income tax on par with states like Himachal Pradesh and Uttaranchal. This will boost industrialization and job creation. Rayalaseema and North Coastal AP will also get special assistance for economic development on par with Bundelkhand. On Polavaram, the Center has agreed to include most of Bhadrachalam division in Andhra Pradesh to ensure that the project can be completed without any hassles. It has also ensured continuation of all ongoing projects based on surplus water in the Krishna basin benefiting both the States. The Center has agreed to take up establishment of a 4000-mw thermal power plant and construction of roads in Telangana. It has made firm commitments in place of vague promises on establishment of educational institutions and creation of infrastructure facilities in residuary Andhra Pradesh. Dr. JP said that the Center and main opposition party have also agreed to amend the Constitution if courts strike down entrustment of law and order in Hyderabad City to the Governor as unconstitutional. Dr. JP underlined that people have to remain vigilant and ensure that whichever party comes to power at the Center will redeem all the commitments made by the present UPA Government. Dr. JP appealed to people of Seemandhra to shed their sense of loss over Hyderabad city becoming part of Telangana. Barring Government jobs, every Indian will continue to enjoy all the facilities they have been enjoying in Hyderabad city. “There is the great task of fulfilling the aspirations of Telangana youth in front of us. And there is the greater task of helping future Andhra Pradesh overcome the sense of loss, acquire confidence, and promote prosperity. Both States should emerge as the top two States in India in a decade. That should be our goal. 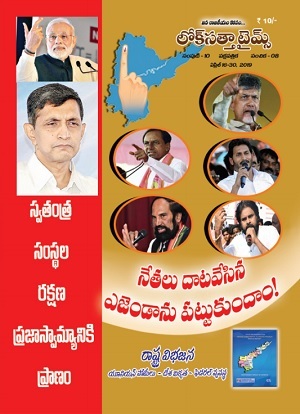 The LokSatta is ready to stand by the people to fulfill this dream”, Dr JP asserted. State Lok Satta Party President Katari Srinivasa Rao, Vice President D. V. V. S. Varma, Working Committee member Nandipet Ravinder and Yuva Satta President P. Sivaji took part in the media conference.